Holidays such as Halloween needn’t be too expensive. Use our tips to spice up your Halloween decorations on the cheap! It’s that time of year to put up all of those Halloween decorations. Those decorations may look cute; but, what they do to your wallet is anything but. Many of these decorations can really drive up the cost of decorating your home. However, with just a little bit of careful planning and by following these tips, you can learn how to save money on Halloween decorations while maintaining a minimal cost. You can make things like DIY Glowing Eyes, purchase more affordable pumpkins, decorate your front door, or easily just swap out some spooky light bulbs outside your home. If you wish to purchase cheap pumpkins, try buying directly from the source. Head over to your nearest pumpkin patch. You will certainly find the best pricing and freshest pumpkins there. You can easily swap out some spooky light bulbs on your front, side or back porch to add a spooky ambiance or setting. When you head to your local hardware store, just pick up some red, yellow, purple or blue lights to add a creepy hue to your property. Place these decoration strategically around the premises. What’s great here is they are recyclable. You can use them year after year. Have you ever tried to create a bat cave in your home? The kids will most likely love it! And, it’s super affordable! Just download this free download. Begin printing out and cutting out bat shapes. Use black construction paper to create a wall of bats in your home. 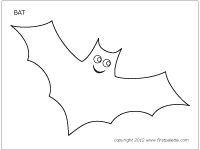 If you want to decorate the bats, use chalk to draw wings, eyes, or even labels complete with spooky names. Even your youngest children can help you with this activity. Save the bats in a safe spot for the next Halloween. You also can use old pillow stuffing to create webs around the bats or even on your outside windows. If you want to create a front door fit for a monster, use construction paper to turn your front/side door into a spooky or silly monster. Use strips of paper to add hair, a mouth, eyes, and nose. Then, attach everything to the door. Use yours and your children’s creativity for this one.